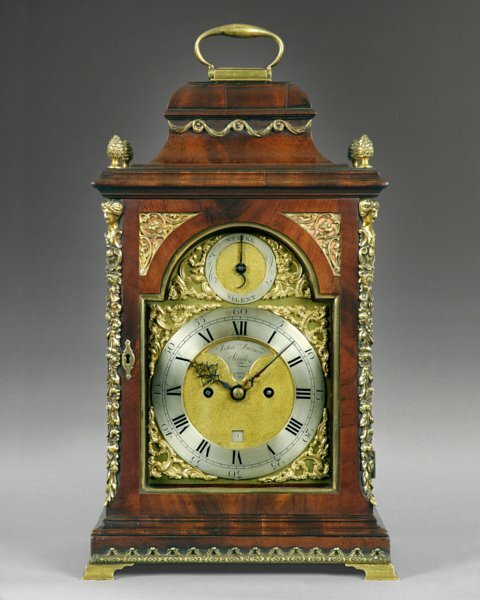 Anthony Woodburn deals in fine antique clocks - 17th & 18th century English antique bracket clocks, longcase clocks and antique barometers, including pieces by JOHN TURNER, London. A good George III brass mounted mahogany veneered bracket clock. The bell-top case with brass lined front door and brass side frets stands on brass bracket feet and is surmounted with a single brass carrying handle flanked by four acorn finials. The 7 in (18 cm) wide break arch brass dial is mounted with a silvered chapter ring, silvered strike/silent ring in the arch and rococo spandrels. Beneath 12 o’clock and within the matted centre, is a recessed silvered cartouche signed by the maker. The eight day duration twin fusee movement has five pillars with verge escapement and rack strike sounded on a bell. The back plate and brackets are engraved in a floral design. John Turner is recorded as working at 10 London Wall 1788-1794.